← How can you take a commodity and turn it into a vital requirement for your client? 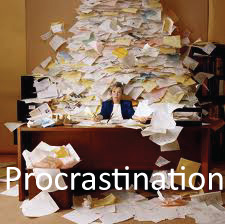 Procrastination is the art or putting off or delaying important actions to a later time. This is a close relation to, and often at odds with, the emotional need to have something useful to do and be engaged in life. Can a little procrastination be a good thing? Can procrastination be a good thing? I have an important project I am trying to get under way (more on this another time) and every time I sit down to action my to-do list I find something else to do, which seems important, and gets in the way. I called up my business coach and we had a heated debate on procrastination. He pointed me to a great article by Erin Falconer, editor of Pick the Brain. According to this article procrastination comes in two categories – structured and unstructured – and there are beneficial aspects to each. This is what Dr Piers Steel of Psychology Today calls ‘Beneficial Procrastination’. Here is my take on the items in this list. Networking – you have a list of contacts you really should touch base with but don’t have the time. Procrastination is an opportunity to stay in touch. Of course you feel good as there will be a long term dividend. Planing ahead – The only thing better than actually doing something is thinking or talking about doing it. Take time to identify, record, and schedule all your tasks. Leave the best and most important for last so you can savour the victory. Errands – How about that dentist appointment? Or car service? These important tasks become appealing to the best of procrastinators. Of course your car and health will be much better by doing these today. Assist others – If you are not going to do your own work, you can at least deliver on the help you promised your colleague last week. Structured procrastination is a great way to keep busy, but sometimes that doesn’t cut it. When you’d rather not do anything work related, unstructured procrastination is the way to go. It might seem like laziness, but what’s wrong with that? Unstructured procrastination is essential for recharging creative energy and allowing the unconscious mind to work on difficult problems. These are 6 productive ways to avoid work completely. Relax – If you feel a strong desire to procrastinate, there’s probably a reason behind it. Relaxation is important for a healthy productive lifestyle, why not do it now when you can’t get anything else done? If you put off something on purpose because you think it’s a good idea to delay, you’re not procrastinating. You’re scheduling or prioritising, sometimes just to feel the motivational thrill of doing it all at the last moment. Procrastination is when you planned or felt that you should have done the thing earlier, and then delayed anyway. In short, it is putting off despite expecting to be worse off. Sometimes we are lucky and the task we have been putting off doesn’t need to get done after all – a truly happy moment, like when a project gets cancelled and it turns out the boss doesn’t need that report you never got around to writing in the first place. So the answer is, yes, procrastination can make life a whole lot more interesting, more rewarding and can save you from being unproductive. Just make sure you seloect the right things to procrastinate on. At the end of the day make your new list for the next day. There is no reason you can’t do other tasks as long as your have the vital things covered. Life is not one big ‘to do’ list, it is about enjoying life and allowing beneficial procrastination refresh and revitalise your life. This entry was posted in Monday Motivational Minute and tagged focus, motivation, planning, procrastination, success. Bookmark the permalink.